Self-driving cars, such as GM's Chevrolet EN-V urban mobility concept, could be available by the end of the decade, according to GM. Photo by GM Corp.
General Motors Vice President of Global Research and Development Alan Taub announced at the Intelligent Transport Systems World Congress yesterday that vehicles with partially independent driving systems will be available by mid-decade, with fully independent vehicles potentially becoming available by the end of the decade. “The technologies we’re developing will provide an added convenience by partially or even completely taking over the driving duties,” . Taub stated. “The primary goal, though, is safety.” Such technology uses GPS, cameras, sensors, radars and portable communication devices to conduct vehicle-to-vehicle and vehicle-to-infrastructure communications. 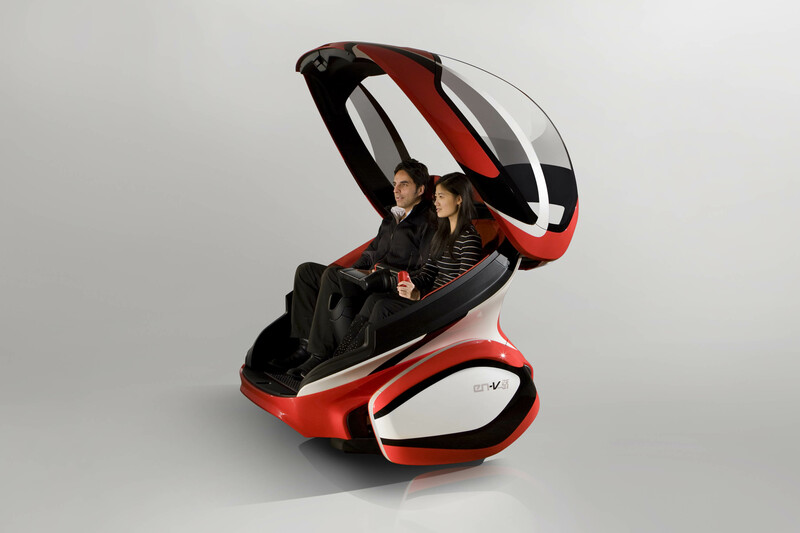 Contemporary vehicles, to varying capacities, are already beginning to feature these systems. On Sunday, GM showcased the self-driving ability of the Chevrolet EN-V urban mobility concept at the Intelligent Transport Systems World Congress, which is equipped with collision avoidance, pedestrian detection, platooning and automated parking and retrieval. The biofuel market value will more than double in the next decade, calculates Pike Research in a newly released report. The increased production and consumption of biofuels will amount to a market value increase from $82.7 billion in 2011 to $185.3 billion by 2021. This 2021 production volume will total 65.7 billion gallons per year worldwide—a 127 percent increase from 2010 production levels. The Americas are expected to produce 71 percent of the world’s biofuels. Electric vehicle owners may soon be able to use smart phones to monitor their vehicle’s battery level, charge schedule and energy costs, among other things, thanks to a new joint project from a IBM Research and EKZ. The research team is conducting a pilot program that combines a smart phone application and a data recording device to create an informational intermediary between the vehicle, driver and energy provider. The data recording device collects an array of information related to an EV’s charging, and in turn uses an IBM cloud-based cellular network to makes this information available to both the vehicle’s owner and energy provider. The near real-time information aims to enrich the decision-making of EV drivers and utility providers managing power grids. Beginning in 2004, as an incentive for greener transportation, hybrid vehicle drivers in California were permitted to use car pool lanes even if they were driving solo. Though when the average carpool lane vehicle speed dropped below 45 miles per hour last summer, the state revoked this privilege enjoyed by its 85,000 hybrid vehicle drivers. A new study by research at University of California, Berkeley’s Institute of Transportation Studies investigated the impacts on this change and found that traffic, as a whole, including in the carpool lanes, has become more congested. The report offers several solutions for combating these traffic ailments, including having all commuters take turns using carpool lanes on different days, or having High Occupancy Toll lanes where drivers pay a fee to use carpool lanes.